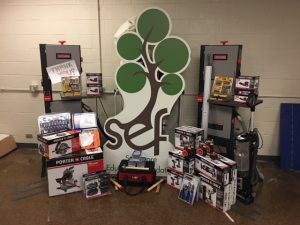 Please join us in supporting the SEF’s mission to enhance and enrich educational resources for the children of Sycamore. Your donation to the Cultivating the Future Campaign is an opportunity to invest in education and be a catalyst to make the foundation’s big ideas a reality. You can make your gift today or make a three-year pledge to the campaign. You can make a difference and help SEF with the Cultivating the Future Campaign by sharing your story and plan with neighbors, friends and family. Please share this information with others and utilize it as a guide to discuss this opportunity with those that are interested in making an impact in the lives of Sycamore students. Make a donation today during Give DeKalb County! 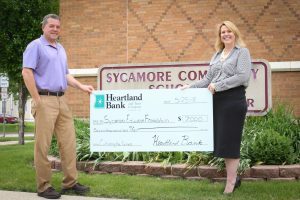 Sycamore Education Foundation is on it’s way to meeting the $150,000 goal in support of their mission and long term planning for a full-time employee, thanks to Heartland Bank and Trust Company. Having a director to grow relationships within Sycamore, with Sycamore School District’s alumni, the community, and businesses would have a huge impact on the SEF and Sycamore School District. “We are incredibly privileged to have a foundation of this caliber supporting our schools and children for many years in this community. Heartland Bank is proud to contribute to their effort to create a strong and sustainable support system for the foreseeable future,” said Julie Sommese, Heartland Bank Senior Vice President and Market Leader.